In 2009 Liam Neeson began a new phase of his career as an actor. Before 2009 he was always put into roles as the father figure and mentor to a younger protagonist. He did quite well in handling these roles. Most of the time he was the only good thing about the films he was in and it was due to how he handled the supporting role given to him. But 2009 changed everything as Liam Neeson arrived on the film scene as a bonafide action hero in his role as a former CIA Special Activities Division operative in the action-thriller, Taken. That film surprised many and Neeson’s badass portrayal of a father out to save his daughter opened the eyes of many filmgoers who always saw him as the calm, wise elder. He has taken on the mantle of older, action-hero characters from Harrison Ford who lived off and became rich doing roles such as the one in Taken. Two years later we have another film where we get to see Liam Neeson in another role which cements his place in the action-hero pantheon. Also like Pierre Morel’s film, this one takes place in Europe and directed by another European filmmaker trying to make a name for himself in Hollywood, Jaume Collet-Serra. It would be disingenious to say that Collet-Serra had it in him to direct a film as tight and fast-moving as Unknown. His two Hollywood productions were the remake of the classic horror film, House of Wax, and the underappreciated horror film from 2009, Orphan. 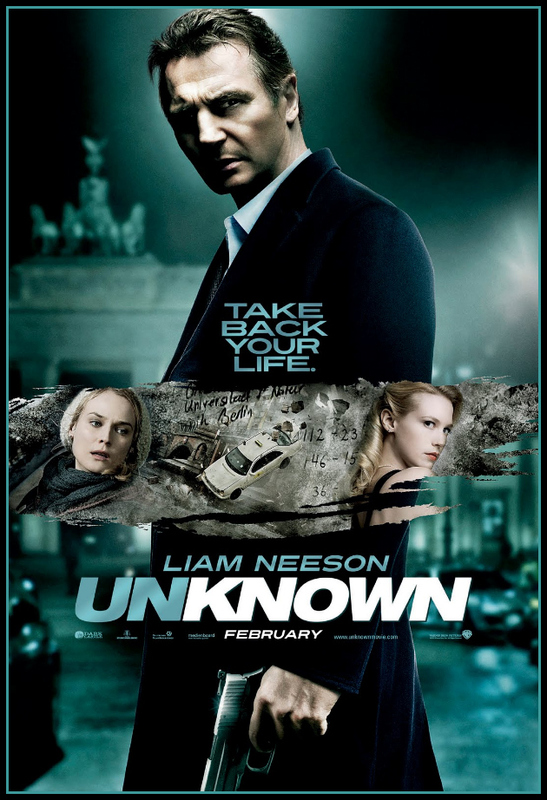 With this new action-thriller, Unknown, Collet-Serra and Neeson create a film which owes much of its film dna to Hitchcock and his mistaken-man classic, North by Northwest. I would also say that this film also owes much of its action and characters to one of the early 1990’s best sci-fi action films, Paul Verhoeven’s Total Recall. The film begins with Neeson’s character, Dr. Martin Harris, and his wife Liz (played by Mad Men‘s January Jones) arriving in Berlin to attend a biomedical conference. Right from the start Neeson makes us believe in Harris being an everyman. The good professor doesn’t seem the alpha male-type. But after certain seemingly random circumstances and events puts Harris in a coma for four days we begin to see signs and glimpses that Neeson’s character may have more to him than meets the eye. It’s when Harris’ awakens from his coma that the meat of the film’s story begins. We know going in that Neeson’s character knows he’s not crazy and that someone out there has made things appear as if he is becoming insane. Maybe the accident in the beginning of the film have given us a false perspective on the film. What we might be seeing could be a manifestation of Harris’ mental breakdown from the accident and subsequent coma. But little clues in the film’s dialogue keeps things vague, but not so much that our initial stance that Harris’ is being manipulated won’t be the final endgame. It is the endgame in the film which may make or break the whole production for some people. The screenplay by Oliver Butcher and Stephen Cromwell is not the strongest out there and it tries to be too complex with its red herrings when trying to keep it simple would’ve sufficed. One could almost sense that the two writers were trying to be too Hitchcock that they lost sight of how Hitchcock’s films were simple affairs which only appeared to be complex. Yet, despite some necessary leaps of logic that audiences needed to make to continue believing in the film, Unknown manages to keep the core story moving forward to it’s inevitable conclusion. The performances by everyone involved is what keeps this film from spiralling out of Collet-Serra’s capable hands. One would almost certainly point out the strong work by Neeson as the Harris. January Jones’ Liz Harris, at first, seemed like an extension of her Betty Draper character from Mad Men, but as the story moves forward we get to see more layers of personalities in her character to make her interesting beyond the dutiful and supportive wife. But the standout performance outside of Neeson has to go to Diane Kruger as Gina, the taxi driver who was involved in Neeson’s character getting in his accident in the beginning of the film. Kruger arguably is one of Hollywood’s classic beauty, but she has an ability to actually keep that beauty in check with her acting that we believe her to be the “everywoman” in some of the roles she plays. Beauty doesn’t come into the Gina character’s personality. Kruger does a great job of playing the pawn in a much larger game being played on Neeson’s character. Her reluctance to help him gradually crumbles as she soon realizes that her own safety and survival is now inextricably linked to unraveling the mystery of who Martin Harris really is. Unknown is one of those films that actually has an advantage being released in the so-called dead season which runs from January and into March. It’s a film season when studios put out films they have no faith in being a major blockbuster which means summer and Holiday season release are out. It’s not prestigious enough to be put out in the Fall and early Winter. But as a piece os well-done escapist fare it’s perfect for this so-called dead season. Jaume Collet-Serra has shown that even when working from an average screenplay he knows how to get the best out of his cast to sell the film to the audience. He also has a firm grasped on pacing and how to handle action sequences. In the end, the film still loves or dies by how the audience reacts to Liam Neeson’s character. While his Martin Harris is not the Bryan Mills from Taken, by the time the final scene fades to black we begin to see how similar the two characters really are and how much they share. Until the big name films start dropping in beginning in March (blockbuster season seem to come earlier and earlier with each passing year), Unknown is one of those films that should help make this early months of the film season more entertaining than it usually is in year’s past. As an aside, for those who know their films would understand why I say that, in addition to this film having aspirations of being Hitchcockian, Unknown definitely borrows or has been influenced by some of the story and character developments of Verhoeven’s Total Recall. I almost half-expected for a half-mutant seer named Kuato to make an appearance to explain it all to Neeson’s ccharacter. I think I’ve been a little bit too hard on Canada as of late. I mean, sure — our northern neighbor did give us Paul Haggis and Vermont. However, Canada also gave us Degrassi: The Next Generation, Jason Reitman, Atom Egoyan, David Cronenberg, Denys Arcand, and my friend Lindsay Dianne. So, I’m here to say right now: I love Canada! And in order to show that love, this week’s edition of Lisa Marie’s Favorite Grindhouse and Exploitation Trailers is dedicated to films produced up in Canada. I’ve never seen this movie and I don’t know much about it beyond the fact that it was made in Canada. Looking at the cast list at the end of the trailer, I don’t see any familiar names. But the trailer fascinates me because it somehow manages to be intriguing and dull at the same time. I haven’t actually seen this one either and I’m kind of glad for that because seriously, I am scared to death of rats. I remember this one time when I was little, I was visiting my grandpa’s place in Arkansas and he lived in this big three-story house out in the country. And I was sitting out back in this swing when suddenly, this rat jumped out of a third story window and it landed right next to the swing and broke its neck and died with its tail twitching as I watched. I still have nightmares about that. Anyway, this film is apparently not to be confused with Bruno Mattei’s Rats: The Nights of Terror. This is one of the several million slasher films that ended up being made in Canada by American film companies looking for a tax shelter. Just imagine how much shorter the trailer would have been in the movie had simply been called Huge. Incidentally, the film was directed by Paul Lynch, the same guy who did the original Prom Night. Arleigh would never let me live it down if I did a post and didn’t include a trailer for a David Cronenberg film. So, here you go. Now, to be honest, this trailer is only interesting if you know that 1) it’s for a film directed by David Cronenberg and that 2) he made this in between making Rabid and The Brood. Now I know that this trailer probably screams out, “David Cronenberg just needed the work,” but Cronenberg has actually spoken with a good deal of fondness about this film. I personally haven’t seen it but I guess if anyone could somehow make a movie about drag racing exciting, it would be David Cronenberg. Here’s a more representative example of what we think about when we think about Cronenberg. Originally, I was going to end this with the 2 Cronenberg films but then I remembered that Dennis Hopper’s Out Of The Blue was a Canadian production and there were simply no way I couldn’t end with that film. Out of the Blue is, quite simply put, one of the greatest films ever made. I’ve been meaning to write a review of it for a while now but it’s been difficult for me to know where to begin because, in many ways, viewing Out of the Blue was as much of a personal experience for me as watching Black Swan.